When your parent, spouse, or other loved one is suffering from the symptoms of Alzheimer’s disease or dementia, there comes a time when you may no longer be able to provide the care they need without professional help. When you’re searching for a residential care facility, you want to find one that can not only meet their needs and keep them safe, but can also provide them with as high a quality of life as possible. Read on to learn about what features to look for in a residential care facility or nursing home for your loved one with Alzheimer’s, and contact a West Palm Beach elder law attorney with additional questions. Patients with Alzheimer’s or dementia are sensitive to sensory overload and are vulnerable to getting injured in busy traffic if they wander off. Look for a facility that is set in a quiet area far from main roads or highways. Look for a facility with an Alzheimer’s unit that is set apart from the main facility, and one that contains safety measures to ensure that patients cannot easily wander away. There should either be a secure door, or patients should be equipped with electronic monitoring bracelets that alert staff if a patient leaves the secured area. A facility designed to accommodate Alzheimer’s patients should be on a single level to prevent as many falls as possible among residents. The facility should use simple color-coding to indicate bathroom doors and bold location signs with graphics to indicate important rooms. An Alzheimer’s unit should have a ratio of one staff member for every four residents. Staff members for the Alzheimer’s unit should receive special training to work with patients with impaired memories. Ask about the training and continuing education that staff members receive. Find out about special activities planned for residents with memory problems, and what sorts of special services are provided in the Alzheimer’s unit that differ from those in the main facility. Ask questions about how staff members respond to physical outbursts or emotional reactivity among residents, and what is the facility’s policy on restraint use, both physical and chemical. 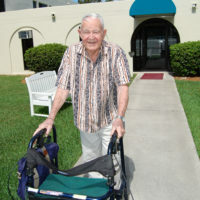 Making the right choice of facility for your loved one with Alzheimer’s is critical. Due to their physical and mental vulnerability, patients with Alzheimer’s and dementia are particularly vulnerable to becoming victims of abuse. According to the Alzheimer’s Association, there are one to two million incidents of abuse each year among patients with dementia and Alzheimer’s living in communal settings. That said, experts believe that the rates of abuse are far higher, due to the fact that these patients’ claims of abuse often aren’t believed, or they are unable to recognize that the abuse is occurring. If your loved one shows signs of abuse, contact an elder abuse attorney as soon as possible to find out about your right to file a claim against those who perpetrated the abuse. For assistance with Florida elder law issues, such as end-of-life planning, Medicare set-aside trusts, special needs planning, or veteran’s benefits, contact the dedicated and compassionate elder law attorneys at Shalloway & Shalloway for a consultation, at 561-686-6200.